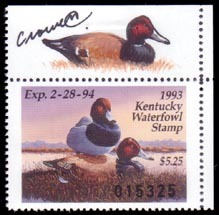 The federal duck stamp was created through a wetlands conservation program. President Herbert Hoover signed the Migratory Bird Conservation Act in 1929 to authorize the acquisition and preservation of wetlands as waterfowl habitat. The law, however, did not provide a permanent source of money to buy and preserve the wetlands. 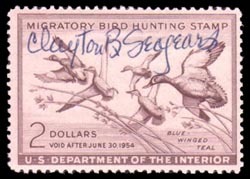 On March 16, 1934, Congress passed, and President Roosevelt signed, the Migratory Bird Hunting Stamp Act. Popularly known as the Duck Stamp Act, the bill's whole purpose was to generate revenue designated for only one use: acquiring wetlands for what is now known as the National Refuge System. 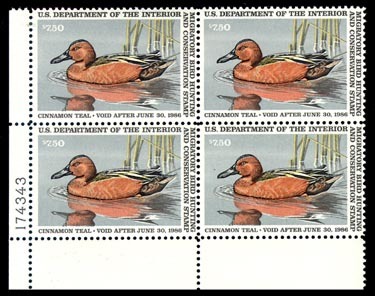 It has been proven that sales of duck stamps increase when the public has been informed of how the revenue generated through stamp sales is used. Jay N. "Ding" Darling, a conservationist and Pulitzer Prize-winning political cartoonist, was appointed the head of the Duck Stamp Program. Darling's pencil sketch of mallards alighting was used on the first duck stamp. 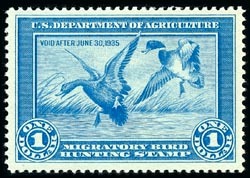 The same design was reproduced on Scott 2092, a 20� commemorative postage stamp marking the 50th anniversary of the Migratory Bird Hunting Stamp Act. In reality, a "duck stamp" is a permit to hunt, basically a receipt for payment of fees collected. Funds generated are used for the preservation and conservation of wetlands. The term "duck stamp" is a shortened term for the message "Migratory Bird Hunting and Conservation Stamp," which appears on the face of the federal duck stamp. In fact, use of the word "duck" is inaccurate, since all waterfowl, including geese, swans, brant and more, are intended to benefit from the sale of duck stamps. Duck stamps are now issued by the United States government and all state governments. Many foreign countries, including Canada, Australia, Mexico, Russia and the United Kingdom have also issued duck stamps. The issuing authorities within the various governments that release duck stamps are usually conservation and wildlife departments. These programs must be created by some form of legislation for the resulting stamps to be accepted as a valid governmental issue. Labels featuring ducks also are issued by various special interest groups, such as Ducks Unlimited and the National Fish and Wildlife Foundation. Their issues are referred to as "society stamps." These items technically are not duck stamps because the fee structure and disposition of funds are not legislated. However, society stamps are very collectible and often appreciate in value. Funds raised by these organizations are also used for waterfowl and conservation efforts. Valid organizations and societies of this type perform a major service to conservation by their donations and efforts, and they merit public support. When are duck stamps issued? 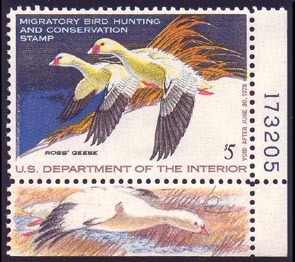 Duck stamps are issued once a year. In most states, hunters are required to purchase both a federal and state stamp before hunting waterfowl. Waterfowl hunting seasons vary, but most begin in September or October, so naturally, stamps are needed prior to opening day of the hunting season. Currently, the federal stamp and more than half of the state stamps are issued in July. Many are issued on the first day of the new year, and a few at the last minute in September or early October. The annual federal duck stamp had a face value of $1 in 1934, jumped to $2 in 1949, and to $3 in 1959. In 1972 the price increased to $5, then up to $7.50 in 1979, $10 in 1987, $12.50 in 1989 and to $15 beginning in 1991. For every $15 stamp sold, the federal government retains $14.70 for wetlands acquisition and conservation, so very little gets lost in the system for overhead. Most state conservation stamps have a face value of $5. South Dakota has the lowest price at $3.00, Louisiana non-resident is the highest at $25.00. Funds generated from state stamps are designated for wetlands restoration and preservation, much like the federal funds, but with a more localized purpose. Most state agencies sell their stamps at face value. However, some also charge a premium to collectors buying single stamps, to help cover overhead costs. Some states also produce special limited editions for collectors. The federal stamp is presently issued in panes of 20 stamps. Originally, the stamps were issued in panes of 28, but because of a change in the printing method (and to make stamps easier to count) a 30 stamp format was adopted in 1959. In 2000, the format was again changed to the present sheet of 20. Beginning in 1998, a single self-adhesive stamp was issued. This stamp and surrounding backing are approximately the size of a dollar bill. Most states and foreign governments follow the federal format. Many states issue a 10 stamp pane for ease of handling and mailing to field offices. Currently, about 10 states issue two types of stamps, one for collectors and another for hunter use. Collector stamps are usually in panes of 10 or 30 without tabs. Hunter type stamps are usually issued in panes of five or 10, many with tabs attached. Hunters use the tabs to list their name, address, age and other data. Some states use only serial numbers to designate their hunter type stamp. State stamps are therefore referred to as either collector stamps or hunter type stamps. Most dealers will distinguish between these types on their price lists. Separate albums exist for both types and are available from most dealers. Plate blocks or control number blocks are designations given to a block of stamps, usually four, with a plate or control number present on the selvage. Such a block is usually located in one or all four corners of a pane. Federal stamps prior to 1959 plus the 1964 issue are collected in blocks of six and must have selvage on two sides. The Federal Junior Duck Stamp Program is a non-profit program sponsored by the Federal Government and designed to promote interest in conservation and wetlands preservation among students in grades K-12. The program includes a conservation and education curriculum that helps students of all ages. It focuses on wildlife conservation and management, wildlife art and philately. All proceeds from sales support conservation education. Governor's Editions have been issued by several state agencies as a means of raising additional income. These stamps are printed in small quantities, most fewer than 1,000. They have a face value of approximately $50, and are imprinted with the name of the state governor. Governors also hand-sign a limited number of stamps. These are usually available at a premium, generally twice the price of normal singles. Hand-signed or autographed stamps are issued in very small quantities and are scarce to rare. Governor's Editions are valid for hunting by all issuing states thus far. Obviously, none would be used for the purpose, however, as it would destroy the mint condition and lower the value of the stamp. Artist signed stamps are mint examples of duck stamps autographed by the artist responsible for the artwork on the stamp. Such stamps are rapidly gaining popularity with collectors, and most can be purchased for a small premium over mint examples. Early federal stamps are particularly valuable and difficult to acquire. Signed stamps by artists now deceased also command a substantial premium. Remarqued Stamps are quickly gaining in popularity with a worldwide audience! Original art on the actual stamp is adding a spectacular flair to collections, making each stamp unique. These are very special, one-of-kind stamps on which the artist of the stamp has personally drawn or painted a dog, decoy, lighthouse and/or duck. The artwork is obtained by commissioning the artist for their work, and generally the stamps take time to complete. All are either signed or initialed by the artist. Through the efforts of Jeanette C. Rudy, the Smithsonian will receive a bequest of a complete remarqued set for display to the public. Stamps of deceased artists will bear a remarque by a living federal artist, as a "tribute" to the artist and their work. The artist doing the remarque will initial the stamp; for example some have been completed by Ken Michaelsen, artist of RW46. This is the way to add that "Special Touch" to your collection! Call 1-800-231-5926 or e-mail Bob Dumaine at bdhouduck@aol.com for pricing info and availability. Prices from $75, inquire now! Printed text stamps are another popular collectible. Generally, these preceded the later pictorial issues. 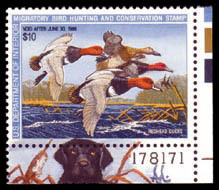 The term is applied to stamps required for duck hunting that contain only writing but no waterfowl illustration. 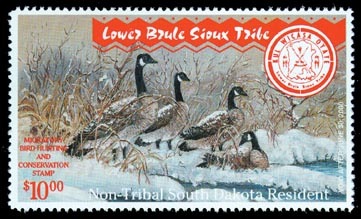 Certain American Indian Reservations and tribes also issue waterfowl hunting stamps. 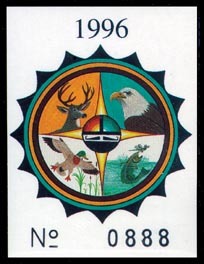 The stamps of these sovereign Indian nations allow holders to hunt on that reservation when a federal stamp is also purchased. Reservation stamps are becoming increasingly popular with collectors as more people discover their existence. With the printing of such a large number of stamps year after year by many different states and printing agencies, errors do occur, but are seldom found. A few federal stamps are known to exist with major errors, but only a few, namely on the 1934, 1986, 1990, 1991 1993, and 2003 issues. Stamps without perforations, with missing or incorrect color, missing or inverted writing on the reverse are all major errors. Smaller flaws, such as color shifts, misplaced perforations, hickeys (or donuts) and other such anomalies are termed freaks, rather than errors. These, too, are collectible and have value, but they do not command the same attention as major errors. Major errors are extremely rare and exist in small numbers. All errors and freaks on duck stamps are very desirable and add a great deal of interest and value to a collection. The first basic rule is to remember that stamp collecting is very personal. You can make your own rules! Most collectors prefer to collect mint condition duck stamps. Many others prefer collecting stamps on license, autographed stamps, plate blocks, stamps signed by hunters, art prints, souvenir cards, first day covers, or a combination. The bottom line, however, is to collect what interests you. Quality is a very important factor in a stamp collection. This applies not only to duck stamps, but all types. Preserving the mint condition of a stamp is crucial for determining value. A perfectly centered stamp will usually sell for a substantial premium over one with normal centering. Very fine (VF) is the norm in stamp collecting, and is the condition priced by Scott Catalogues. Care should be taken not to damage a stamp, including the gum. The mint state of a stamp includes the freshness and original gum, so stamp mounts should be utilized when placing a stamp in your album. When a stamp has never been hinged, the abbreviation "NH" is used by dealers. The National Duck Stamp Collectors Society exists for the benefit of those who collect duck stamps. Dues are $20 a year and are tax exempt. The NDSCS issues a newsletter and provides a membership card and lapel pin. Send your $20 directly to the NDSCS, Membership Chairman, P.O. Box 43, Harleysville, PA 19438. Bob Dumaine is a recognized expert in duck stamps, founder of the National Duck Stamp Collectors Society, writer for Stamp Collector, a past judge in the Federal Duck Stamp Contest and serves on the expertizing committee of Professional Stamp Experts. Dumaine is the owner of Sam Houston Duck Company, a firm that specializes in duck stamps and related material. Note: the federal duck stamp has the distinction of being the longest running U.S. stamp set on a single theme. Copyright � 1999-2014 Sam Houston Duck Co. All rights reserved.